Dietitians are taking back the white potato. It’s endured a bad rep over the last few years, but the white potato is healthy in moderation, especially when served along with protein. They’re easy to make, filling and packed with enough protein and energy to keep teenage boys full until lunch time. Surprise, surprise — these potato nest frittatas are also a healthy take on the much loved, but much maligned white potato. Who knew this controversial vegetable was actually good for you? Comforting, creamy mashed potato is coupled with hearty, sunny side-up eggs and extra veggies for good measure in this recipe that’s courtesy of Nutrition Discovery Labs at Ryerson University. As a vehicle to hold good stuff, like eggs and veggies, the white potato makes it easy to sneak healthy foods into the tummies of kids as well as adults. Bellissimo’s research discovered that two servings of this recipe hold enough protein and carbohydrates to keep boys aged 9 to 14 satiated for four hours. Just imagine how they can curb your post-holiday sugar cravings! Large muffin tins work best with this recipe because they can each hold one full egg. If using smaller tins, whisk eggs together first, then divide mixture between tins. If red bell peppers and shallots aren’t your thing, substitute for any veggie under the sun. Depending on the size of your russets, you may be left with extra potato — so, make another nest! And, don’t forget to leave the skins on — there’s a lot of nutrition in those brown jackets. Wrap each potato in aluminum foil and bake in preheated 350F (180C) oven for 1 hour. Let cool 20 minutes. Refrigerate overnight. Over large bowl using grater, grate chilled potatoes. In large bowl using wooden spoon, stir together grated potato, salt and pepper. Divide potato mixture among 6 large non-stick muffin tins. Using hands, pat mixture along bottom and sides to create a well. Bake in preheated 425F (220C) oven for 15 to 20 minutes or until potato cups become golden. Sprinkle each cooked potato cup with 1 tbsp (15 mL) each: cheese, red pepper, shallot. Crack 1 egg into each cup. Bake in preheated 400F (200C) oven about 15 minutes until egg white is opaque and firm. 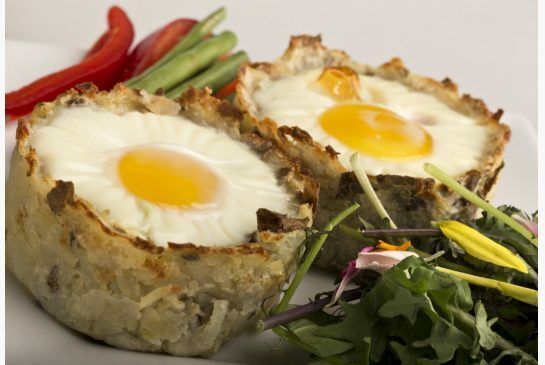 Nutrients per serving (1 potato egg cup): 151 calories, 7 g fat, 3 g saturated fat, 0 g trans fat, 193 mg cholesterol, 510 mg sodium, 11 g carbs, 1 g fibre, 2 g sugars, 10 g protein. Good source of riboflavin, folate and vitamin B12.